I don't know everything about Emerald City Comicon but I will clear up what I can. Will my ticket have my name on it? If I bought for my 5 friends and ECCC didn't ask for their names when I bought them, I can just resell them and that means so can scalpers, right? I bought 4 tickets and I don't know exactly which of my friends can go yet. What happens? I have no idea what the ECCC 2016 badge will look like. But here's what the ECCC 2015 badge looked like and what the current NYCC badges look like: no names. 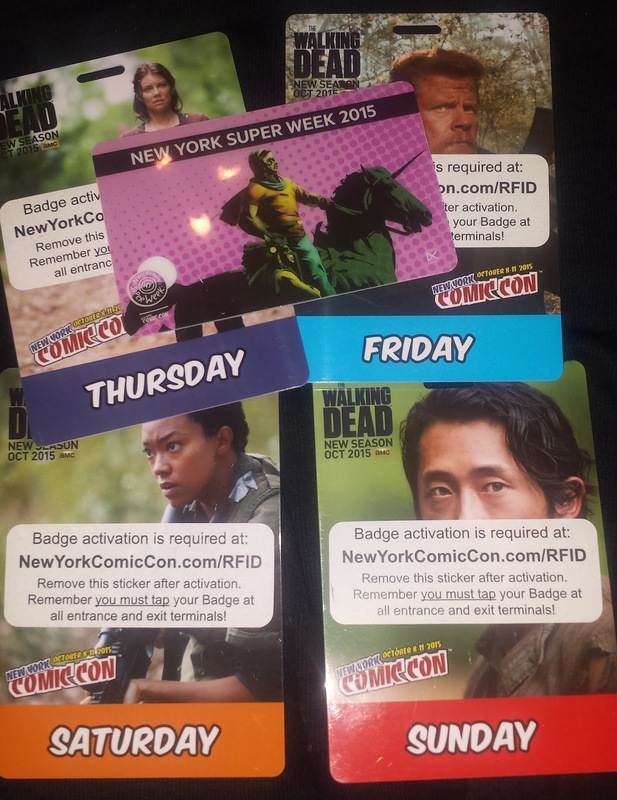 I don't know for sure that ReedPOP will put RFID tech into ECCC 2016 badges as they do with NYCC. With NYCC, you are required to register your badge online. (And linking to your social accounts is encouraged.) ECCC's statement on Facebook: "We are shipping badges but there still will be a barcode scan and ID check for some of our passes." So that suggests a similar process. They're obviously not going to ID everyone and I'm sure we'll still see scalpers slinking around. But overall it's a little more formal and monitored than previous years. Did they deliberately reduce the number of 4-day and 3-day badges to force people to pay more for single day badges? I think they did. This seems to be a popular theory, probably because angry people want someone to blame and ReedPOP seems a good candidate for the role of the greedy corporation. We've all noticed the obnoxious ads on the ECCC site. But Emerald City said, "We did not sell less 3-day passes than last year." And they sold 4-day passes this year as well. Now that only single day tickets are left, I can't afford to go. It's so unfair. I do understand that's still inconvenient for people on a budget. (The price difference almost doubled for NYCC tickets when their full tickets sold out, which I got caught in by a nanosecond. So I get it.) And I know what it's like to be cash-strapped at Comic Cons - I was a broke young scrapper when I started going to SDCC. But I have a hard time believing that $40 is an insurmountable difference for someone attending Comicon when you think of what people spend on meals, their cosplay, the show floor, etc. Maybe that's not you; maybe you're visiting ECCC on a day pass from a Charles Dickens-level orphanage and merely walking around the Con is all you hoped to do on your meager funds. But again, this event didn't rise up out of oblivion. Everyone has had months to save up. When will single day badges sell out? "Soon." How's that for vague? What I do know is that you should go ahead and get yours if you want to go. There's no room for dithering in Comicon. I think one thing you might want to mention to folks is the "Seattle Freeze" issue with Seattle locals. I think a lot of people will be surprised by how reserved/clique-ish/snobbish they can be. I'm not sure if you felt it when you were there, but it's definitely not like SD. So yes, I'll say that the ECCC attendee base is not as friendly and laidback as San Diego's, where everyone just naturally chats up everyone and a general spirit of helpfulness prevails. I wouldn't say Emerald City's culture is cold, necessarily, but the people don't seem to connect as easily. At SD, waiting in line can lead to a new best friend, hearing about 2 parties and finding out about a booth giving out secret swag. At ECCC, people seem to ignore each other in line. (Though maybe that's because the lines don't last long enough for our social barriers to break down.) I've never had an ECCC attendee randomly invite me somewhere, though that happens to me at SD all the time. Last year some women invited me to a private party during ECCCC and I had to be vouched for. On the whole, it's not something that bothers me but a few SDCC veterans might notice the difference. Although with the influx of SDCC and other attendees that seems to be happening, perhaps this will change? At any rate, I might organize an ECCC event for SDCC attendees who don't know many people there or just want to connect with the community, so don't think you'll be alone if this is your first ECCC. You'll be among friends. How different is it going to be now that it's controlled by NYCC? ReedPOP actually runs Comic Cons all over the world, and I have to imagine those events aren't clones of each other. Plus they said they want ECCC to keep its cultural feel. Obviously the infrastructure is different; how palpable the new ownership will be on the show floor and panels and events is unknown. I expect past attendees will still feel at home while appreciating the expanded offerings. So is it worth my going or not? My son likes comic books but I don't and you say that's all there is there. Okay, I'm going to walk this back a bit. I've banged the ECCC drum hard for a few years now and I have repeatedly stressed how great it is for comics fans. Which is still true, entirely. In fact, I expect an even higher level of comic book talent this year - and it was already rather incredible in the past. But I also expect a higher level of Hollywood talent in 2016. Maybe I'm wrong but I think ReedPOP is going to make a point of bringing in big names and making this Con a don't-miss for the general Con community and not just the comic book nerds. They wouldn't have bought ECCC just to keep it at the same size and profit margin; clearly they saw a business advantage in the sale. (Look at its location compared to SDCC and NYCC. Just saying.) So I would predict 2016 is going to have more Hollywood flash. It's also worth noting that Thursday is only from 2-7 pm and "focused mainly on comics" so you can probably shave that day off if you're not a big comics fan. If you're intrigued by ECCC, don't let my obsessive prattle about comic books stop you from going. You'll have a good time. And it's possible that as fast as this ticket sale has seemed, next year will be even faster - so you may want to get in while the getting is reasonable. If ReedPOP really does roll out the thunder next April, you can believe that even more attendees will be dogpiling that 2017 ticket sale the second it goes live. How many more guests are going to be added? I don't know if I want to commit to this since they've only listed 3 names. Guests will be added all the way up to the Con. I feel safe assuring you they will be guests you want to see. Again, ReedPOP isn't going to have their first Emerald City feature C-listers. They want to come out with a bang. That's why they name-dropped Fiona Staples and Nathan Fillion the day of the sale - they knew it would excite both comic nerds and Hollywood fans. The days of waiting for guest announcements before buying tickets are pretty much dunzo, anyhow. At some Cons like Salt Lake and Phoenix you can afford to wait but most popular Cons sell out months before those announcements get made. It's a leap of faith. Is it too late to apply for a table in Artist's Alley? According to pro friends, it is almost impossible to get into ECCC - it's such a huge get for artists that it eclipses even bigger Cons in both sales and prestige. They didn't allow applications for the 2016 show, although there is a waiting list. Probably good networking, though. And that's it for now. I promise to stop the parade of ECC posts soon. An Englishman in San Diego posted an interview this week with Mike Armstrong from ReedPop. It was focused on NYCC, but I think it's fair to presume that his general statements would apply to ECCC. He was asked about the new policy of not reselling badges and what people should do if they end up purchasing and badge and not attending. Essentially the response was that reselling a badge at cost is okay - passing it on to a friend or family member. But ReedPop does not want people scalping their badges, and they actively check EBay, Craigslist, etc. for people reselling above cost and shut them down. The Beat posted an article a few months ago surveying comic artists who attend a number of conventions, and ECCC came out as one of the top cons (perhaps the number 1 con) for accessibility to fans and money made/return for a AA table. Given this, I can see why it's so popular with creators, and therefore so difficult to get one! This year, ECCC has stated that AA will be completely filled up with people who were in AA last year - they got first dibs and all tables were taken. And FWIW, I like the ECCC posts. 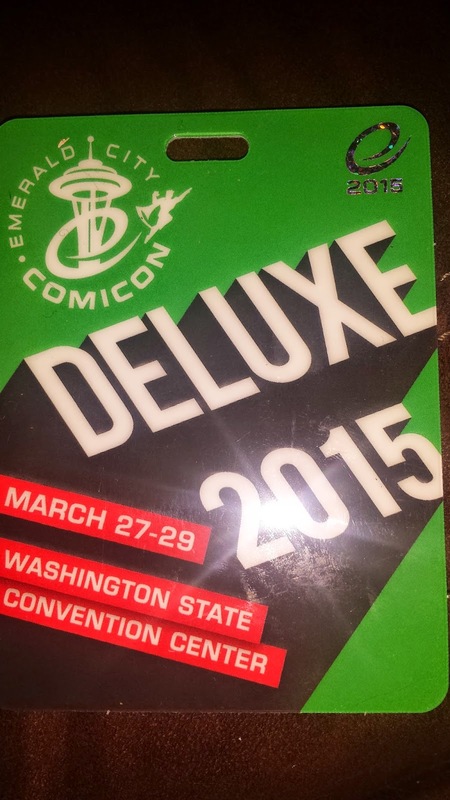 I've been reading this blog for years, but it was the ECCC posts that really excited me. Everyone posts about SDCC, but it is the posts about other cons that make this blog stand out. JMHO. I'll hunt that interview down and link to it. I assumed that was their policy. One, it's kind of hard for them to assert a precise level of control and two, I know their real objective is shutting down egregious scalpers. Can't fault them for that. I'm glad you like the ECCC posts. I know SDCC readers are over it, but the reality is that come Open Reg, some of them will probably wish they had invested in another Con. And for better or for worse, I think ECCC is on its way to even bigger things. This is not Reed Pops first time sponsoring ECCC. Last year was. ReedPOP bought ECCC 10 weeks before the 2015 Con, so they really didn't have time to put their stamp on anything last year. I'm counting this year as their true maiden voyage.